According to the new market research report, the industrial absorbents market is expected to grow from USD 3.7 billion in 2018 to USD 4.7 billion by 2023, at a Compound Annual Growth Rate (CAGR) of 5.1% during the forecast period. The report, prepared by Research and Markets and entitled “Industrial Absorbents Market By Material Type (Natural Organic & Inorganic, Synthetic), Product (Pads, Rolls, Booms & Socks), Type (Universal, Oil-only, HAZMAT), End-use Industry (Oil & Gas, Chemical, Food Processing), and Region – Global Forecast to 2023“, states that the major factors driving the industrial absorbents market include growing environmental concerns and regulations regarding oil and chemical spills. The synthetic segment is expected to be the fastest-growing material type segment in the industrial absorbents market. The industrial absorbents market by material type has been categorized into natural organic, natural inorganic, and synthetic. Synthetic industrial absorbents are capable of absorbing liquid up to 70 times of their weight, which makes them a highly adopted material for industrial applications. Synthetic absorbents have properties such as non-flammability and excellent water repellency, which makes them suitable for applications in oil-only and HAZMAT spill control products. 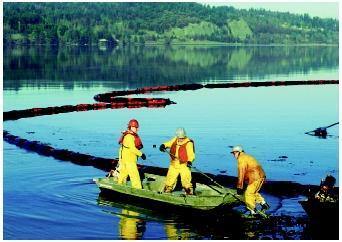 Booms and socks are ideal industrial absorbents products for spill control. 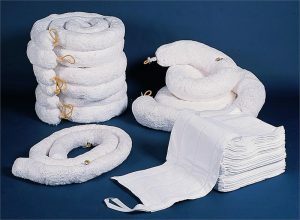 Booms and socks are widely used for oil-based spill control in water environment. Booms have excellent water repelling properties and are best suited for water environments such as sea, lakes, and ponds, among others. Socks are flexible tubes which are used to control and contain spills on land environment and are ideal for quickly absorbing oil- or water-based liquid spills on land. In regions such as the Middle East & Africa and Europe, there are high occurrences of large spills in marine areas, which drives the growth of booms & socks segment in the industrial absorbents market. HAZMAT/chemical absorbent products are used to cleanup spills involving acids, bases, and other hazardous or unknown liquids as these spills can have harmful impacts on the environment and can be dangerous to the living beings present in the vicinity. HAZMAT/chemical absorbent products are designed to absorb the most aggressive acidic or caustic fluids and are majorly composed of synthetic absorbents. In addition, stringent regulations in regions such as North America and Europe on chemical discharge in to the environment have led to an increase in the demand for spill control products designed for chemicals. Therefore, this factor has fueled the adoption and application of HAZMAT/chemical absorbent products, which is driving the growth of the industrial absorbents market. Chemicals are hazardous materials, and can cause severe harm to humans or environment if accidentally released or spilled in the environment. Chemical accidents usually occur during transportation of stored chemicals. Chemical manufacturers need to immediately respond to accidental spills that occur during manufacturing processes to minimize the impact of spills on the environment. Furthermore, regions such as North America and Europe have stringent norms with respect to chemicals and spill response. All these factors have fueled the growth of the industrial absorbents market in the chemical end-use industry. Asia Pacific industrial absorbents market is expected to have the highest growth rate during the forecast period due to the rising awareness and pressure to reinforce strict environmental regulations for spill response & control and pollution caused by end-use industries. 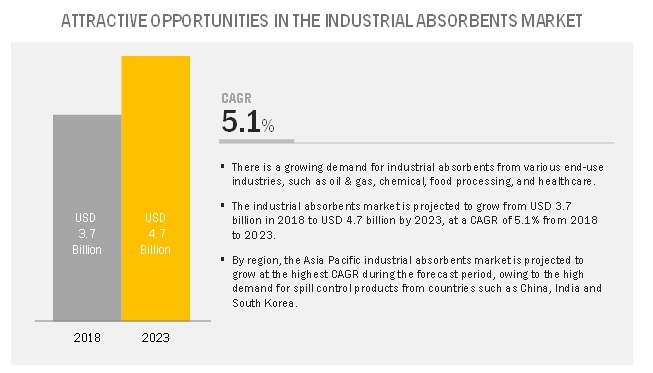 The industrial absorbents market in Asia Pacific is driven by the demand from countries such as China, Japan, India, and South Korea, owing to rapid industrialization and rising occurrences of small liquid spills across the end-use industries. The major manufacturers in the global industrial absorbents market are 3M Company (US), Brady Corporation (US), Decorus Europe Ltd. (UK), Johnson Matthey Plc (UK), Kimberly-Clark Professional (US), Meltblown Technologies Inc. (US), Monarch Green, Inc. (US), New Pig Corporation (US), and Oil-Dri Corporation of America (US).